After its successful launch in April 2010, the NIU World Music Festival is back again in 2011. In this one-week long event, six full-length concerts featuring various world music traditions will take place in the NIU Music Building. 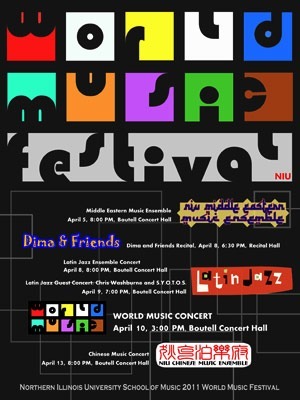 The Middle Eastern Music Ensemble, a new student group added to the NIU World Music curriculum last semester, will kick off this year’s festival at 8 p.m. Tuesday, April 5, by performing Pan-Arabic art, folk and pop music with special guest Nay (the Middle Eastern flute) artist Naeif Rafeh. The hour-long concert takes place in the Boutell Memorial Concert Hall. At 6:30 p.m. Friday, April 8, the “Dima & Friends” concert in the Recital Hall will feature three Syrian-born musicians, guest vocalist Dima Orsho, drummer Omar Al Musfi and ud player Aboud Agha, performing Syrian folk and art music. Also on the same evening, under the direction of Greg Beyer, the NIU Latin Jazz Ensemble will let the audience explore various Latin dance rhythms in a jazz concert at 8 p.m. in the Concert Hall. This vivid and energetic rhythm will continue to resonate at 7 p.m. Saturday, April 9, with the guest appearance of Chris Washburne, the renowned trombonist, and his award-winning group, S.Y.O.T.O.S. The highlight of the World Music Festival is the annual World Music Concert, which begins at 3 p.m. Sunday, April 10. As usual, a showcase of world music performances will be featured at this concert. Invited guest groups include the Thai Classical Music Ensemble of the Thai Fine Arts and Culture Institute in Chicago and S.Y.O.T.O.S. Student groups featured at the concert are the Samba Batucada group, Chinese Music Ensemble, Latin Jazz Ensemble, Middle Eastern Music Ensemble and African Gahu drumming troupe. A “Meet the Musicians” lecture will be held at 2 p.m. in the Concert Hall prior to the concert program. Guest artists and directors of each of the ensembles will give brief talks about their performances and groups. The audience is encouraged to attend this pre-concert talk, sponsored by the NIU Lifelong Learning Institute. To conclude this kaleidoscopic 2011 World Music Festival, Chinese music artist-in-residence Yung-Hsin Chen will conduct the Chinese Music Ensemble at 8 p.m. Wednesday, April 13, in a concert featuring a mix of traditional and modern Chinese music repertoire. The event takes place in the Concert Hall. All events are free and open to the public, and the concert venues are accessible to all. Children of all ages are welcome. For more information, contact Jui-Ching Wang (815) 753-7979 or via e-mail at jcwang@niu.edu.